Last night was gluten-free friendsgiving, that’s right- no family or gluten allowed. Sounds kind of rough at first, but turned out totally awesome. 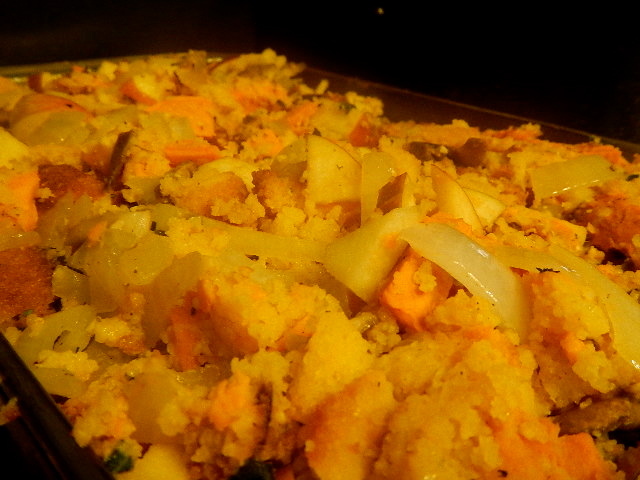 I made this Sweet Potato/Apple Cornbread stuffing with coconut oil and it turned out reeeally good. Don’t let me get started on philosophy. How bout I just give you the recipe in case you’re in the mood for a different kind of stuffing this year. This recipe will serve 15 PLUS leftovers AND left unders…ha, you can easily halve it. Directions: Bake your cornbread (I’m going to leave you on your own for this one) and then chop it into crouton sized squares that you toast until they are pretty dry. 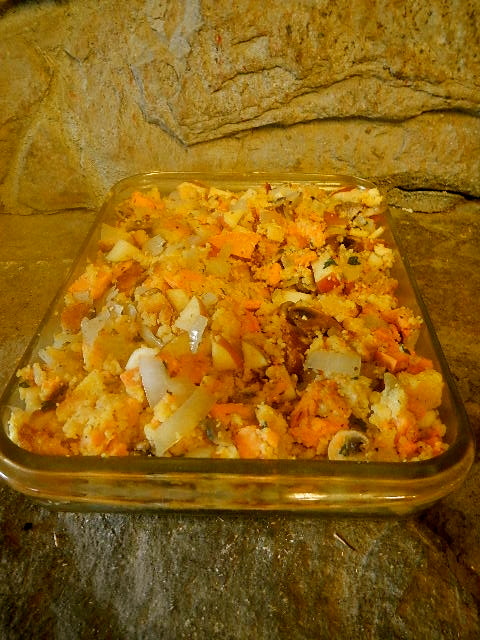 Then chop apples and baked sweet potatoes and put that a large bowl with the cornbread croutons. In a large skillet, start sauté onions and mushrooms in coconut oil, then add 2 cups of vegetable or chicken stock to the pan to allow your ingredients to heat and combine. In a separate small pan, heat 1 cup of coconut oil until melted and then add the sage and rosemary into the coconut oil so that it can soak into the oil (make sure you’ve turned off the flame before you add the herbs). After a minute, add the heated and herbed oil into the mushroom and onion mixture so all of the flavors can combine. Pour the stock, onions, mushrooms, herbs and oils over the crouton apple sweet potato bowl, and toss until everything is well incorporated. Make sure there is a fair amount of moisture in the stuffing, if you feel it needs more, add more stock or drizzle more coconut oil. This stuffing will be gluten free (presuming you used GF cornbread) and vegetarian (presuming you used veggie stock) until you aggressively shove it into your Turkey. What you don’t aggressively shove into your turkey, you should bake at 350 degrees for 30 minutes.